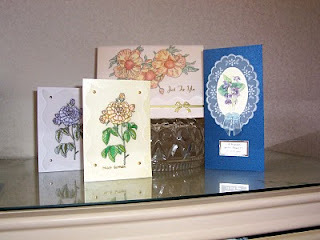 Here are some recent cards made partly with parchment. 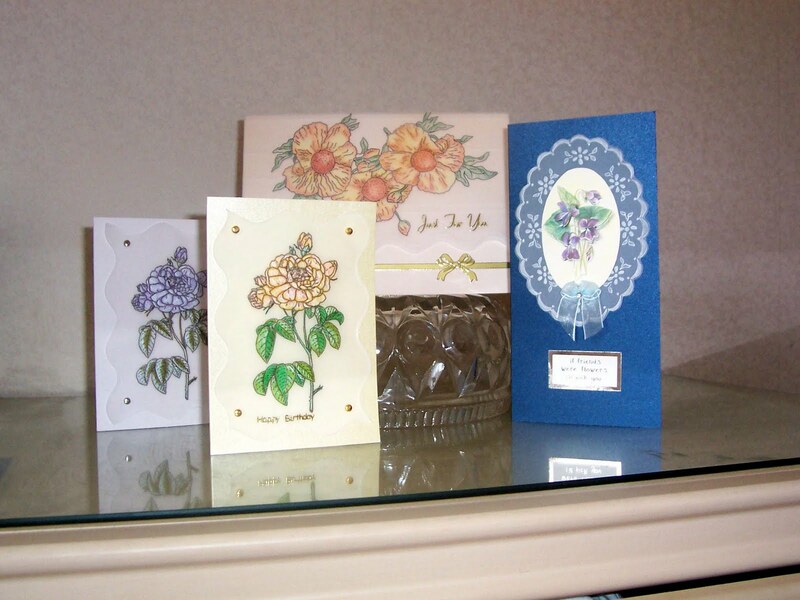 Previously I have used parchment just for tracing and adding colour and the largest card shown above is just that. After seeing the beautiful work that Pergamano artists can do I'm keen to try my hand at more complicated work and treated myself to a starter's Pergamano kit. So far I have advanced to embossing and adding some colour and am thoroughly enjoying it. The small cards are pretty basic but I think they are pretty. The tall slim card is my favourite. I used a pattern that came with the kit and I think it looks just like Broderie Anglais, which I love! I placed a posy of decoupaged violets within the frame and a little bow to finish. My next project is using a perforating tool and it will be a Christmas card. Can't wait!! I used a lightweight parchment that Joanna Sheen used to stock but will be using a heavier weight as I get more confident. I've also got my eye on some gorgeous die cut decoupage that will look lovely with the broderie anglais effect and will be doing lots of repeats of this card design. I'm loving it! sorry, I can't make the links work. very nice looks like fun!